One of our most popular activities (ours and yours) last summer was this Ocean Animal Movements post. We were ready for a new Spring themed version, so we tried it out this morning and loved it! 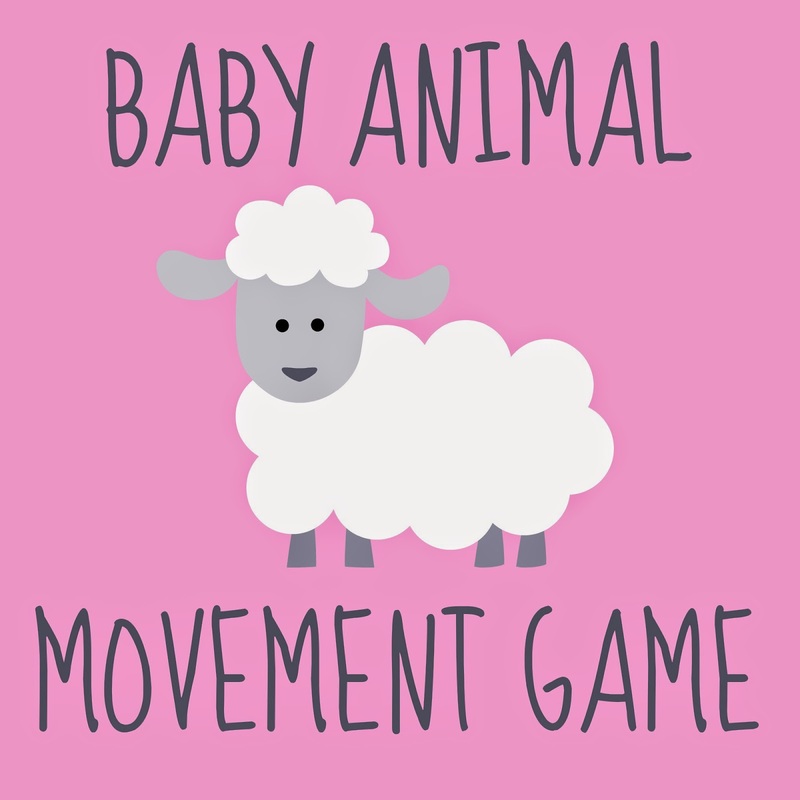 Our simple baby animal movement game is a fun way to teach kids about animals, learn some new vocabulary, and get kids moving! 1. Print off cards (download the cards here) on pastel/spring colored cardstock. 2. Tape cards to floor using painters tape. - Start by walking around (or running) to each card with your child. 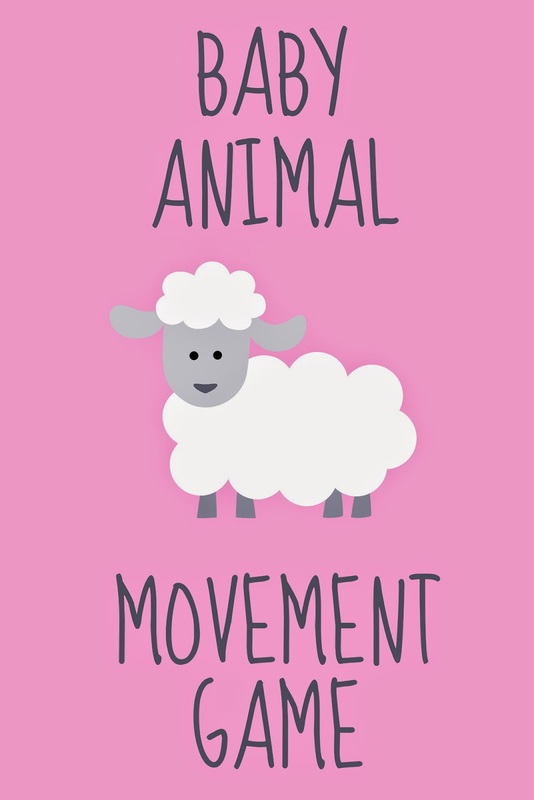 When you get to a card, point to the picture, say the name of the baby animal and the animal's mommy, read the action statement, and then demonstrate how your child can do the action stated. Have them copy you and then move to the next card. - Show your child an action, have them try and run to the correct animal card, say the animal name, and repeat the action. - Incorporate balls. Name the animal, alphabet letter, or action and have your child bounce the ball over to and then throw it at the correct card. - For older kids, work on reading the action sentences. Tell them to find a specific animal and when they get there, read the sentence below the picture while acting it out! - For younger kids, incorporate color recognition. Since each card is a different color, tell them to go to a specific color card. When they get to the correct card, ask which animal they see on that particular color card. Or to make it easier you just can say, "Go find the pink cub..." and then do the action together. You can also talk about different actions that cubs might do and then practice acting them out. - Name the mother animal and then have the child try and find the baby animal card. For example, "Find the animal who's mommy is a horse." Once they find the correct card, act out the action stated on the card. - Our last version of the game included taping the cards up at eye level and giving my son a bean bag. I would ask a question and then he would throw the bean bag at the correct baby animal target. We worked on beginning letters/end letters/letter names when I would say, "Throw your bean bag at an animal that ends with the letter n..." or "Throw the bean bag at an animal that starts with the /c/ sound." I think he loved this version the best because he is very interested in baseball right now. If it had been a bowling game he would've loved it even better... but I'm all bowled out right now! If you try this, let me know what other ways you adapt it so we can try them too!! I would love to get a copy of the activity pages, even the ones from last year. I am just finding all of these great blogs with ideas for my daycare! Thank you so much! What a great way to teach and most importantly --- get the kids moving! I'm featuring this in a huge roundup of ways to get kids moving on Friday. Come by on Friday and check out all the other features -- I'm pretty excited about this round up of energy busters! Good morning. I would like to get a copy of all your activity pages. great idea to do in the daycare or give to parents to do at home. always thinking of ways to get the toddler moving when we cannot get outside. thank you! Hello! I love this idea for my kiddos at the Mother's Day Out that I teach at. Would you mind emailing them to me. I cannot seem to download them on my computer. Thank you! You have such great ideas, and I appreciate all the help I can get!